To receive further updates on this Home Depot (NYSE:HD) trade as well as an alert when it’s time to take profits, sign up for a risk-free trial of Strategic Trader today. Last week the S&P 500 came within 2% of its all-time high. Frankly, this is pretty incredible. We’ve had bullish expectations for the market this year, but even we are a little surprised the stock market has recovered as quickly as it has. Don’t get us wrong. We’re not complaining. This is a fantastic surprise, and we are taking full advantage of it. One stock we really like is Home Depot (NYSE:HD), and we’re recommending a bullish trade on it this morning. The dramatic decline in longer-term interest rates — like the 10-year Treasury Yield (TNX) — has pulled 30-year mortgage rates down too, and that is great news for the housing sector. The cheaper mortgage rates are, the easier it is for home buyers to qualify for new mortgages and for existing home owners to refinance their older, higher-interest mortgages. Many of those people who are moving into new homes, or are pulling equity out of their current homes, are going to make their way to Home Depot to buy paint, tools and other supplies to fix up their homes. This increase in spending should drive the company’s revenues higher. We know that HD’s management team is extremely effective at squeezing as much margin as possible out of its revenues, so bottom-line earnings are also likely to grow. We’re not the only ones who are expecting good things from HD. 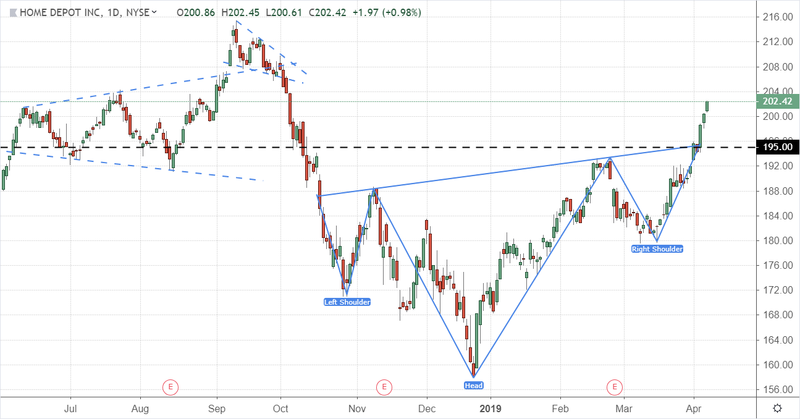 Traders were pushing the stock higher last week, causing HD to form an inverted “head-and-shoulders” bullish continuation pattern. Based on this pattern, HD is likely to climb back up to its September 2018 high of $215.43 in the long term. In the short-term, however, we want to take advantage of this bullish momentum with a put-write with a strike price near the neckline of the price pattern. This former up-trending resistance level is likely going to serve as new support if the stock does decide to pull back at all. To find out which SBUX puts we’re selling — and to get access to our full portfolio of income-generating trades — consider signing up for risk-free trial subscription to Strategic Trader today. The post Lower Interest Rates Will Benefit HD appeared first on InvestorPlace.